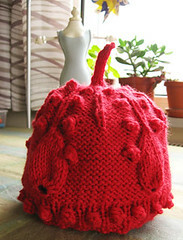 Norah Gaughan's droplet hat from Knitting Nature book . It was quite a fast knit (2 days). I hope my swap pal will like and wear it. As an alternative, I knit the Calorimetry from knitty.com. t was another super fast knit (2 headbands in one day). Thats see wonderfull in red ! 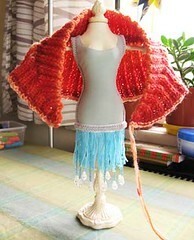 And your tinny modelform too..
At first I thought the colorimetry was an actual size for an adult shawl. It would be very pretty as that. 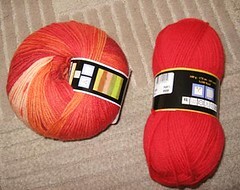 Now, to create the larger pattern and figure out how much yarn it would need.